Connecting small motors to a power supply by the form of plugs and switches don’t require any additional step for starting the motor. However, the induction motors of high power require a suitable device for starting because they take an excessive amount of starting current. There are various starting methods used for starting induction motors because Induction Motors draw very high starting current (5-7 times more) compared to the full load current of the motor when it’s started. Therefore, to avoid the motor from burnout and heating due to the high value of starting current, various types of starters are used for starting induction motors. The kind of device used for starting the induction motor is called the Direct ON Line Starter (DOL). Direct ON Line starter is the simplest kind of starter that connects the motor directly to the power supply through a three-phase contactor. The Direct on Line Starter usually consists of a Contactor, Circuit Breaker and an Overload relay for protection against any damage. An Electromagnetically operated contactor is used which can be opened by thermal overload relay whenever a fault condition occurs. Contactors are typically going to be controlled by separate start and stop buttons, and there is also an additional contact on the contactor is employed across the start button as a hold in contact. For example, the contactor used is electrically latched based and closed whereas the motor is working. Overcurrent faults occur mostly and mainly due to ground faults and short circuit faults. When such type of fault occurs at any place a large amount of leakage current start to flow from the circuit and can cause huge damage to not only in the system but also someone’s life. Therefore, fuses and circuit breakers are used that show quick response towards fault when such type of fault (large) current passes from the system. That’s why to protect the system from the short-circuiting and also from the overload current we use MCCB’s or Fuses of specific ratings. 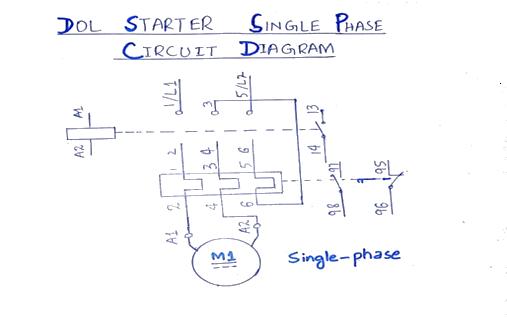 When the amount of current larger than the rated current of the device passed through the system such devices operates and open the circuit until the fault is removed from the system. 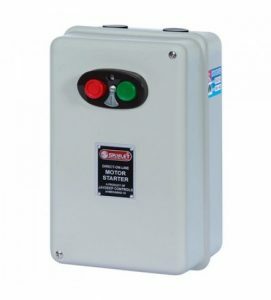 We can also say that when a little higher amount of current beyond the rating of motor pass Overload protection starts operating and prevent the machine from any hazard. If the overload current persists for a long span of time then things and machines get damaged. Overload protection doesn’t trip even if a high value of current flows for a short span of time such as the starting of the motor. Overcurrent protection rating is always selected with so much care that it must provide enough protection against high current and also it must allow enough current without operating the overcurrent protection for the motor to operate under heavy mechanical load. Whenever motor draws too much amount of current to fulfill the load demand and if load demand goes beyond the allowable limit, such condition or situation is called as Overload. An electric overload occurs when an excessive amount of current passes through electric wires or from motor windings. The wires or windings can heat and melt, with the risk of starting a fire. Therefore, overload protection is used in it. It is basically a type of safety protection when the motor draws too much current or overload current and causing the overheating of the electrical machine. So that’s why we use a different kind of overload relays to avoid the system or machine from overheating due to the excessive amount of current drawn for a too long period. Sometimes motor starters come with built-in overload relay. Overload relays are classified on the base of different tripping classes. Tripping class is a term used in overload relay designing which means how much seconds an overload relay takes to trip. Overload protections are provided with the help of an overload relay. Overload relays used here are of various types. Electronic Relay: Overload may be a solid-state device having adjustable trip setting mentioned on them also called as the electronic relay. Thermal Relay: If they are interfaced with temperature sensors it is called as a thermal relay. Magnetic Relay: And if they only operate for a high amount of current flow then it is called as a magnetic relay. The maximum rating of the overload protection device is 125% of the full load current rating for maximum motors. DOL Starter basically comprises of only two buttons one of them is ‘green’ and other is ‘red’.‘Green button is used for starting and ‘Red’ button is used for stopping the motor. The Direct ON Line Starter actually consists of a contactor, an MCCB or circuit breaker, and an overload relay for protection whenever a fault condition occurs. The above mentioned two buttons ‘stop’ and ‘start’ or also called as ‘Red’ and ‘Green’ buttons are used to control the contacts. For starting the motor, we press Green Button and the contact is closed and therefore full line voltage start appearing across the motor. Contactor can either consist of 3 poles or 4-pole depend upon the design. In our case, the contactor used is of 4-pole type. There are three “Normally Open” contacts from where the motor is connected to the supply lines, and the fourth one contact is called as “hold on contact” that is an additional contact and this one energize the contactor coil after the start or green button is released. The additional coil gets de-energized if there is any fault occur and then starter disconnects the motor from supply mains. The connection of contactor can be done among relay coil, supply voltage as well as thermal overload. The L1 contactor is connected from normally open (NO) to R-phase using MCCB. The L2 contactor is connected from normally open (NO) to Y-phase using MCCB. The L2 contactor is connected from normally open (NO) to -phase using MCCB. Contact-(13, 14) and(53, 54) is a normally open (NO) contact and they close only when the relay energizes. Contactor Point-(53) is connecting to start button point-(94) and (54)-point of the contactor is connected to a common wire of start/stop button. Thermal overload relays are connected to T1, T2, and T3 respectively. Between the main contactor and motor overload relay is connected. Normally Closed Connection-(95, 96) of Thermal Overload Relay is connecting to Stop Button and Common Connection of Start/Stop Button. 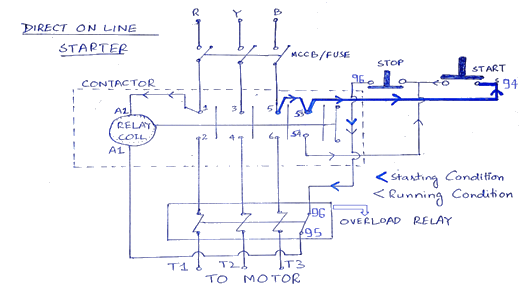 A1 point of Relay Coil is connecting to anyone Supply Phase and A2point is connecting to Thermal overload relay’s normally closed Connection-(95). (i) DOL starter wiring connection with start and stop buttons are shown in the above figure (1). Between the mains supply terminals and motor terminals the DOL starter main terminals are connected and with the two terminals of the three-phase power supply as described in figure (1) the control circuit is energized. (ii) Current will flow through one phase to the control circuit and the contactor coil to the other phase when the start button is pressed. Contactor coil gets energized due to this current that makes to close the contacts of the contactor and in the result of this three-phase supply is connected to the motor. The start button is sometimes called as push button because when this button is released the control circuit of DOL starter still provide the power supply via Hold-On-Contact. The current path via contactor coil will break when the stop button is pressed and due to this the contactor contacts drop out, thus breaking the power supply to the motor. We can also say that the overload relay coil operates. (iii) Depending on the heating effect of the load current thermal overload protection relay operates because the heating effect is directly proportional to load current. More the load current more is the heating effect. Spring loaded contact in the control circuit trips out only when bimetallic strip used inside it expands due to heat. This all happens when the amount of load current is too much that it has the ability to heat the thermal coil. Relay operating speed is defined by current adjustment. Normally it must be 3-5 times the rated current of the motor. (iv) Remotely operated DOL starters are also used for control the switching of the motor from any desired place. But there is a condition for remote control based switching that one should know, that all the remote “OFF” push buttons always be connected in series with “OFF” pushbuttons of the starter and vice versa (all the remote “ON” push buttons always be connected in parallel to “ON” pushbutton of the starter). Very cheap and economical Starter. More comfortable, simple to operate and control. The control circuit is much simpler. Very Easy to troubleshoot and easily understandable. Direct on Line starter provides 100% torque at starting. From starter to motor only one set of cable is required. It connects the supply to the delta winding of the motor. The size of DOL is so compact that is occupies very less space. The starting current of the motor doesn’t reduce. Direct ON Line starter has very high starting current or too much current 6 to 8 times of full load current. Due to the huge thermal stress on the motor, the lifespan of the machine reduces. There is a significant dip in voltage in the electrical installation because of too much in-rush current and due to this other customer connected to the same lines affected, hence this is suitable only for small motors. The mechanical stress on the mechanical systems is increased because of unnecessary high starting torque, even when not required by the load and this is very dangerous for machine life. DOL starter is only suitable for motors of rating less than 10kw. DOL starter disadvantage is that it gives the highest possible starting current. If the high inrush current of the motor does not cause an excessive voltage drop in the supply circuit a direct online starter can be used.